Lars Andersen, so what’s the big deal? This self-titled medieval speed archer has taken the internet by storm more than once. He made THE most viewed archery video EVER. We’re going to tell you who he is, what he’s done. Show you ALL his videos and fill you in on the controversy surrounding them. You’ll also learn what he’s doing now and who his rivals and peers are. As quickly as his fame rose so, too, did his detractors. They attacked the basis of his skills, the history of archery he portrayed. And the possibility that the shots he makes are even possible without camera trickery. So, Who is Lars Andersen? What bow does he use? The Controversy - Is it all a trick? So, Who is the World’s Fastest Archer? Not to be confused with Lars Anderson a Major League baseball player. Or indeed the Larz Anderson Auto Museum in Massachusetts. Lars Andersen, from Denmark, is a painter by profession specializing in storytelling scenes, portraits and provocative art. He’s also authored two books about role playing medieval battles and the building of the equipment for those battles. Currently he is working on a book of archery. 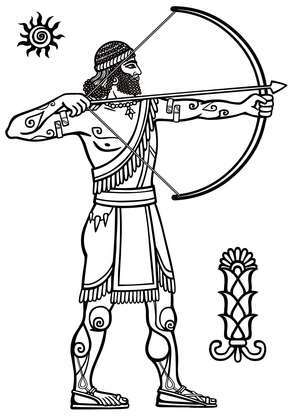 This historical depiction holds his arrow on the outside of the riser too… easier to draw or fact? What he is most well-known for though is entertainment due to his mastery in the art of archery trick and speed shooting. He uses bows without sights based on historical manuscripts. His first venture into archery was partaking in a faux medieval battle in Denmark in 2003 using soft tipped arrows to fend off large armies and attack castles. This lead to a fascination in ancient shooting techniques. Modern target archery is based on shooting still targets at known distances. A little different from hitting fast moving targets at unknown distances that could shoot back! Knowing that modern archery was a far cry from what he wanted to learn, Andersen delved into ancient manuscripts and sought the help of experts in archery techniques of the past. He wanted to learn how to shoot quickly. Lars used books entitled, “Arab Archery, An Arabic Manuscript of About A.D. 1500”, “KITAB FI ILM AN-NUSSAB” and “Saracen Archery”. There is mention that the Saracen’s were trained to shoot 3 arrows in 1 ½ seconds. Based on his research and never-ending training, one of his first steps away from modern archery to improve shooting speed was made when he began to shoot the arrow on the outside of the riser. This allowed for quicker placement of the arrow on the bow. No longer did he need to bring the arrow around the riser to the inside of the bow the way modern archers do today. Andersen also began to utilize techniques that he developed to enhance his ability to shoot fast. Eliminating the need for a back quiver, he was able to hold several arrows in his shooting hand in such a way he could rapid fire the arrows into the intended target in a manner that has never been seen in modern times. It was after more than a decade of intense training on his own that Lars Andersen posted that viral video of his shooting techniques, the reason for those techniques and the history behind it. Today, with over 47 million views, it may be the most viewed archery video ever. the list is endless in this fast-paced video…. 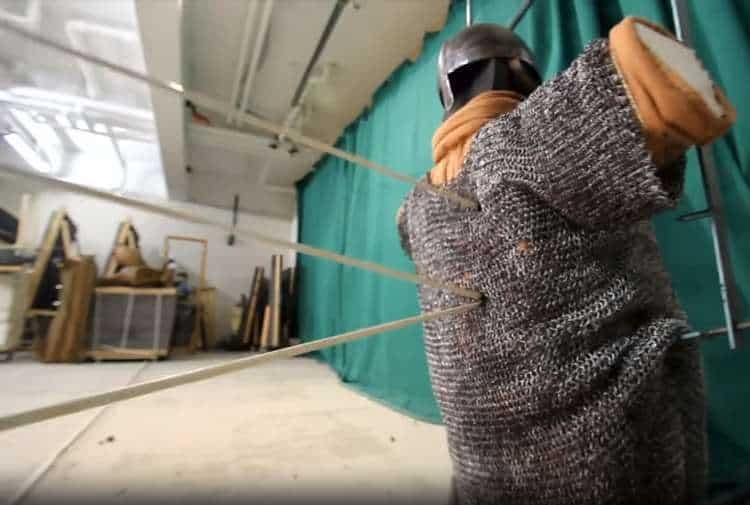 The voice over on the video explains what Lars Anderson has learned about medieval archery, how the Hollywood version of archery and target archery differ from what he has learned and how he applies his knowledge to speed/trick shooting creating his own style. This was not his first foray into archery videos however. His first was “Reinventing the Fastest Forgotten Archery” in 2012. Andersen uses two models of bows for his shooting. One is a custom-made longbow from Estonia made by Falco with his own collaboration. The other is a unique style horseman’s bow that Lars designed himself, incorporating a short length with a mounted compound bow like half-wheel. These incorporations lend to better trick shooting. These bows are not the 120 pound draw weight of the historical past, but rather more conducive to Lars Andersen’s size and strength today. He, himself, admits he cannot pull a 120 lbs bow. The Controversy – Is it all a trick? Shortly after his video went viral, other videos were quickly published trying to debunk Andersen, his knowledge and abilities. For instance “A Response to Lars Andersen: A New Level of Archery” (see below), which has 3.5 million views, hits all the points most naysayers of Andersen use. The video breaks down the historical claims made by Andersen depicting the liberties the publisher felt Andersen took in his interpretations. For instance, Andersen claims that back quivers were utilized by Hollywood to depict all archers but that is not the case. Andersen films himself making a mockery of back quiver wearing archers stating that the arrows would have been hand held. The publisher of this video uses ancient drawings and paintings to show soldiers/warriors using back quivers. The video points out that Lars Andersen did not rediscover this form of archery as some forms of are still in use today in different cultures. The video also allows the viewer to see the difficulty in some of his shots, such as catching an arrow out of the air that has been shot from a bow. This video points out that unless the arrow is traveling very slowly the arrow will injure the arrow catcher’s hand. It also discusses the idea that we don’t know how many takes it took to get a successful trick shot or that the editing of the video allowed Andersen to accomplish his feats. The fact that Andersen is in all likelihood shooting a bow with low poundage and the majority of the time he is not reaching full draw making the poundage even less so his arrows would not penetrate real armor of the medieval times is also pointed out. This video, among others, also points out the false accusation that shooting on the side of the riser away from the archer is not possible due to archer’s paradox. Knowledgeable archers know that archer’s paradox does not prevent shooting from either side of the bow. (Here’s a great video on Archer’s Paradox video featuring American trick shooter Byron Ferguson https://www.youtube.com/watch?v=O7zewtuUM_0). Here’s another more well thought out video that the explains the three main issues people take with A New Level of Archery: Andersen’s portrayal of modern archery, his use of historical sources and his filming technique. Lacking absurd delivery, this video is a drastically different that the one identified above and many other video’s attempting to debunk Andersen’s claims. It is thought that had Andersen released his video without the historical voice over and published it solely as entertainment he would have had less detractors. In response to the many videos attacking him, Lars Andersen published a video in April of 2015 entitled, “Lars Andersen: Questions, Answers and New Archery“. It is in this video that Andersen makes an attempt to answer the questions brought on by those that produced videos to downplay his accomplishments. He addresses catching arrows, his luck in shooting, the number of shots it takes to do a difficult trick. Lars talks about back quivers in history, what we do and don’t know about archery history in a general sense along with the two books, Arab Archery and Saracen Archery, and their importance to his speed shooting. He flat out admits the shots he can and cannot do, points out other archers that he follows and the shots that some of them can make and he cannot. Such as American Byron Ferguson who can shoot an arrow through a ring when thrown in the air. Andersen talks specifically about each fact his detractors make against him attempting to put the issues to rest within this video. Lars Andersen then went on to publish another video, “Once There Was Archery“. That was produced in much the same manner and context as New Level of Archery but with new information in regards to medieval archery, how it is depicted in warfare and how it pertains to his techniques. He spoke of a new book, Mahabharata, and its teachings while again using modern archery as a comparison to medieval speed shooting. After being up for only a few days, Lars took the video down. He then posted on his Facebook page explaining that people have made him understand that he cannot produce very very short video to try to tell the story of archery while at the same time showing what he had learned. This next video entitled “Lars Andersen Removed Video, Now What?“, provides constructive criticism about Lars, his videos and what he needs to do to become more successful. The producer does such a good job of explaining the backlash, what Andersen needs to do to be more successful and eliminate the issues that Lars himself reaches out to discuss what needs to be done in the future. Lars thought was to now produce a series of trick shooting videos with strong content and more time attributed to the videos without the history ties and mentions of modern archery. He also wanted to produce a long video on the history of archery and his interpretations of this history. Following his new strategy, Lars Andersen now has his own YouTube channel, larsandersen23, with 243,000 subscribers. In the last 7 months he has produced 5 different episodes on trick shooting. The lengths of these videos are short, ranging from 59 seconds to 1:50 seconds. Below is a run down of the 5 videos and their contents. Since producing these short trick shooting videos, the amount of pushback Andersen has received has been very minimal. It seems his new strategy of separating trick shooting from archery history is working. There are others out there that are medieval archery speed shooters but utilize different techniques. Murat is a Turkish speed shooter. He is not as quick as Lars Andersen but uses the traditional Turkish Combat Style of speed shooting. The way he holds his arrows is somewhat similar to Lars Andersen but the way he loads them to the string is quite different. Another speed shooter with yet a different style. This video shows him setting a record shooting arrows pulled from a quiver, which Lars Andersen doesn’t use. Lars Andersen’s hero, Lajos Kassai of Hungary, shoots quickly and accurately on horseback. 12 arrows in 18 seconds. According to our next video, the world’s fastest archer is Lars Andersen. He successfully shot 11 arrows into the air one after the other before the first one hit the ground. All these archers bring a different technique to archery, as it is what works for them. Each of these techniques were probably used in medieval times in battle. Based on what is presented, Lars Andersen would win a contest between all 4. That’s due to his technique and how he holds his arrows in his shooting hand and how he loads them on the string. He can shoot very quickly. Lars Anderson may be the World’s Best Medieval Speed Archer who reinvented shooting techniques or just an archery entertainer. Whether the struggle is with the history behind his techniques or his talk of modern archery. Maybe how he films his content or the how he presents himself. One thing most can agree to is that Lars Andersen has worked very hard to become talented in shooting a bow and arrow. The entertainment value and wow factor he provides is difficult to find in the archery world and has helped to create a resurgence in archery popularity.